Much discussion in quilt/art circles recently regarding two prizewinning quilts at the big Houston show this year. You probably recognize the image as the famous photo taken in California by Dorothea Lange, documenting the travails of migrant workers during the drought of the Dust Bowl. That photo was black and white, while Greaves has imagined it in color and executed it in machine applique. On the Quiltart email list, typical for listserv discussions, the focus started on a nitpick: was it a copyright violation to appropriate the Lange image. (Apparently it’s in the public domain, since Lange was working for the U.S. government.) But it quickly moved to a discussion of whether it’s a Good Thing to copy somebody else’s photo(or even your own photo) to make your own artwork. Somebody pointed out another big winner at Houston, ironically in the category of “innovative artistry,” which was a replica of a painting. When these quilts were first discussed on the list, one commenter put the subject to rest by suggesting that the show entry form should require that the artist has gotten permission to use any text or imagery. This strikes me as a solution to the wrong problem. Among other things, it would forever rule out quotations from the Bible or Shakespeare, not to mention remixes of Vermeer or Picasso. And I think the point is not whether you have somebody’s permission to work from their original, but whether you should. So is it a Good Thing to copy somebody else’s photo or painting? And then is it a Good Thing to enter it as your own work in a big show? Which leads to a final question, is it a Good Thing for the judges to give a big prize to a quilt that reproduces somebody else’s image? Arguably the Houston judges didn’t know that Landi and Azara’s quilt was so closely based on a painting, although the signage says “original design inspired by a painting by Anna Bocek.” But the judges would have had to have lived all their lives in an aluminum-foil-lined box to not recognize the Migrant Mother as a copy of Dorothea Lange’s famous photo. Check out the whole roster of Houston winners here. This is cross-posted to my blog, Art With a Needle. There is a fascination in the quilt world with reproducing something as faithfully as possible but in fabric or thread. Judges and viewers seem to think that this reproduction is wonderful in and of itself. I’m glad that a few are finally asking out loud, “what point does it prove?” It’s showing plenty of technical skill, but very little in artistic choices. Even those who use their own photos to stitch on are only proving that they are skilled stitchers. I want to know why it has to be thread. If you’re starting with a photo then why not just take the best photo you can and celebrate that (print it on nice paper and frame it rather than onto color sucking fabric)? Or if you like this woman’s painting, why not ask yourself what you like about it (the flowing hair, the color palette, etc.) and riff off that, like amy also posits in her comment above about finding one’s own migrant workers and connection. So yeah, I don’t really like that another artist’s painting reproduced in fabric and thread has been awarded such a big prize. I think it devalues the work of the painter and it hints that the quilter doesn’t trust her own creative vision (or is trying to cover a lack of artistic prowess while still calling herself an artist). Although imitation “is the sincerest form of flattery,” if I painstakingly created an original art quilt, and a photographer or painter copied my design, entered it in a show, and even won a prize for it, I would not be flattered…I would feel violated and disrespected. I’ve been stewing in disgust for several hours here and now I need to say something. Quilters, if you want to be taken seriously as “artists,” if you can’t understand why your work is getting passed up in juried shows in major galleries and museums, if you are left whining about the unfairness of it all, well, this is why: you aren’t mining your own history and you aren’t exploring the WHY of your own work. Artists do this. If Virginia Greaves has a need to explore the plight of the migrant worker, awesome! But WHY? And why use textiles, and what textiles, specifically? How does she, as an artist, make the choices that ensure she is an intricate part of the process and not just an enlarger/photocopier? Get out and photograph your own migrant worker and infuse your work with their misery if you have the need to try and understand it through reproduction and process (but before you run out and do this, ask yourself if you are one of many throughout history who has benefited from the misfortune of a minority group. I’m talking about cultural misappropriation here, specifically, and it’s often more applicable than you may realize). I’m sure this fabric piece is attractive and technically rendered in real life…but it pales next to Lange’s original photograph, which is so voyeuristic and weighty…it is the photographer’s and the writer’s inner conflict to wrestle with what is theirs to take. And you see it in the photograph…I can’t tell you how, but the mark is there, the exchange is there. I am sad that Virginia Greaves has to cope with all of this backlash…she should be happy, damn it, she won a big prize! But now we enter the realm of sour grapes. So frankly, I don’t blame her. I blame the judges and I blame the committee that chose the judges. They are holding this genre back by saying work of this type is 1.) allowable and 2.) prizewinning. What a shame all around. The notes following the definition give examples and names – Richard Prince and Julian Schnabel among them; earlier, Marcel Duchamp and Salvador Dali had got in on the act. The fine art world is a slippery place; is the art quilt world catching up? “the inspired selection and manipulation” – an interesting phrase, but what does inspired mean in this context? The reason this post caught my eye was seeing the fabric portrait of the photo of the woman and children. The idea of putting this photo into fabric wasn’t so unique as my friend Gurli had done this several years ago. When I first saw this piece (reproduced in a magazine) I asked myself why would someone want to do this. Two answers immediately came to mind: one: the challenge, and two: the familiarity. 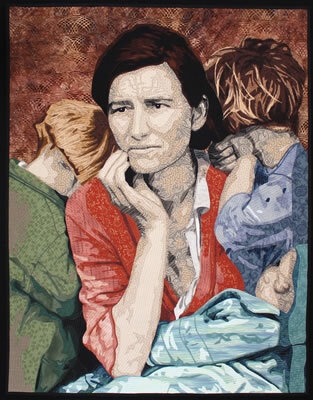 The former speaks to quilting’s long tradition of pride in the skill of manipulating and joining fabrics, and the latter means that the viewer immediately is drawn in to an already much admired and loved image which is part of American history. After reading this post I went to Virginia Greaves’ website and blog, and was interested to find her bloghopping replies. She enjoys the technical challenges of translating an existing photographic image into cloth, and her favourite element of that challenge consists of the “cutting and fusing – this is secretly my most favorite part”. Elsewhere she says that historical subjects are more marketable. So it seems that such exercises are both satisfying and successful. Reading this post I also remembered all the paintings which artists have made, inspired by or even loosely copying art made before them – Picasso and Velasquez, for example. But in these cases the ‘copier’s’ work is very clearly their own, even if the original is also recognisable in the ‘copy’. I guess that is also true in the case of Virginia Greaves – her website is full of work similar to Worry. The desire to challenge oneself by trying to copy a much loved image is one I understand. It is easier to approach in a different medium because somehow that both extends the challenge as well as not seeming quite so disrespectful to the original. Years ago I made a ‘copy’ in stitch of a Picasso drawing as an exercise – but that’s what it was, an exercise. There are works of art in the form of quilts, and there are art quilts, and there are quilts which skilfully reproduce works of art. Areas of these categories overlap – but not all works of art in the form of quilts are good quilts, not all art quilts are works of art, and sometimes quilts which skilfully reproduce works of art can be art in their own right – but not always. Personally, my preference is to see the original mind of the maker at work – I’m not fond of copies to whatever degree, whether done by Picasso, Maisie Broadhead, or Virginia Greaves. Although it is probably meant to be an homage, I believe that in effect it is a belittling of the original. I hadn’t thought to look at Virginia’s website. I see another Dorothea Lange photo to fabric there but this time the photo image is not one I’m familiar with. If I saw this at a show and did not read the explanation, I would be mightily impressed with the composition, subject matter, execution. But once I saw that it was not Virginia’s original design nor from her own photo, I felt cheated – and I see she wants a pretty penny for it. I’m reminded of other times I’ve admired quilts for their originality only to find they’d been made from a pattern – someone else’s originality. – and it made me feel stupid, and thus a little angry. Not so much at the quilter, because most of the quilts in this particular show were not originals – but a little towards the organizers who didn’t require that info on the signage and a little at myself for not being more informed. If you are up on these things, you won’t be fooled, but there’s so much out there, then add all the art from other mediums… I can see how judges might let something like that in unknowingly but certainly not the two examples Kathleen has shared. So now I’m wondering if those who choose to work making copies of others’ art need to consider that additional component, the possibility of a negative response based on feeling duped. No one likes feeling the fool. On the other hand, is it a bit like buying a print when one can’t afford the original artwork? I also followed Meta’s link to her friend’s version of the Dorothea Lange photo. I’m sure Virginia doesn’t know it exists. Goodness – its existence would seem to put another spin on this topic. I’ve made quite a number of portraits from either my own photos or portraits of old masters. Making a pattern of a photo isn’t as easy as you describe. In fact choosing and altering the photo into the right pattern takes up a very long time, more than the actually making of the portrait. I have never seen my portraits as art, but I’ve seen enough fabric portraits come by to know that you do need an artist eye to make a good portrait, to know which parts you can leave out and to make adjustments to the original. So the art part to me is the preparational work of choosing and altering the image into your own pattern. The actually making of the portrait I think is craftmenship, not art. 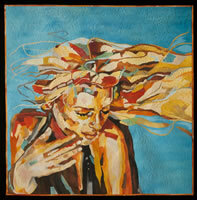 I’ve always wanted to find a way of not just making a fabric portrait but incorporating it into a piece of art. Still haven’t found it, but I’m not really trying I must admit. I think by making a portrait using someones elses work you copy the emotion they’ve chosen to depict in their work, which I think plays a very important role in art, so my opinion is then that you’re then in fact copying someone elses choice and interpretation of an emotion. It would be different if you used their work as a starting point and make an artpiece around this. 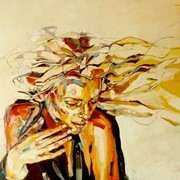 You can see some of my portraits on the gallery of my older work. The contemporary fine art world does have a history of appropriating art works and using them in new pieces, however appropriation is not the same as a straightforward rendering of the exact same image, just in a different medium. If that is what is being done, then all the hard work of making an image has already been done, and to me it is cheating to claim such work as original. I am truly stunned these pieces got prizes, I don’t think they should even have been accepted. 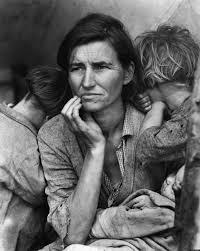 I didn’t know about the Dorothea Lange copy but I had seen the other which left me scratching my head. Ok – so the artist ok’d her to render it in fabric. And I myself was once enticed to see if I could duplicate in fabric a painting I’d become very intrigued with. The comment about using the original artist’s composition made me cringe – yes, that was part of what drew me to the painting – such a fascinating composition. However, I did incorporate different colors and removed the gentleman from the center and replaced him with an outstretched arm to carry my theme which was different from the artist’s. It was a technical triumph for me and it did get entered into a challenge (but was not accepted, I know not why). As much as I loved how it came out, I was never comfortable about showing it because anyone familiar with this artist’s work would have recognized it for what it was. It was a valuable exercise for me but made me realize how important it is to work with one’s own designs, especially if one plans to exhibit or put one’s work up for sale. So many good points shared here (including the last quotation with which I agree) and a valuable discussion that needs to continued on a wider scale.